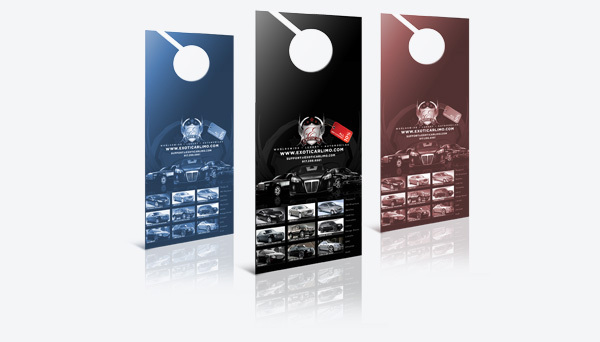 Our wholesale Door hangers are ideal for your clients product promotion and advertising. Designs can be printed on one side only or both. Perforations may be added if your client wants to include other material such as business cards with their contact information, or coupons for special offers and discounts. Our die-cut door hangers are printed on 14 pt and 16 pt ultra-thick stock paper with high gloss UV or flat satin matte finish coating and on 100 lb Gloss Cover AQ coating or Gloss Text coating. These dye cut door hangers can be printed in various sizes with the option of round corners vs. non round corners. We offer the highest quality prints for you and your clients. Door hangers are such a valuable, versatile, cost-effective medium and we take pride in providing both you and your clients with the highest quality prints that are available in the market today. This entry was posted in Door Hangers, Flyers, Printing. Bookmark the permalink.